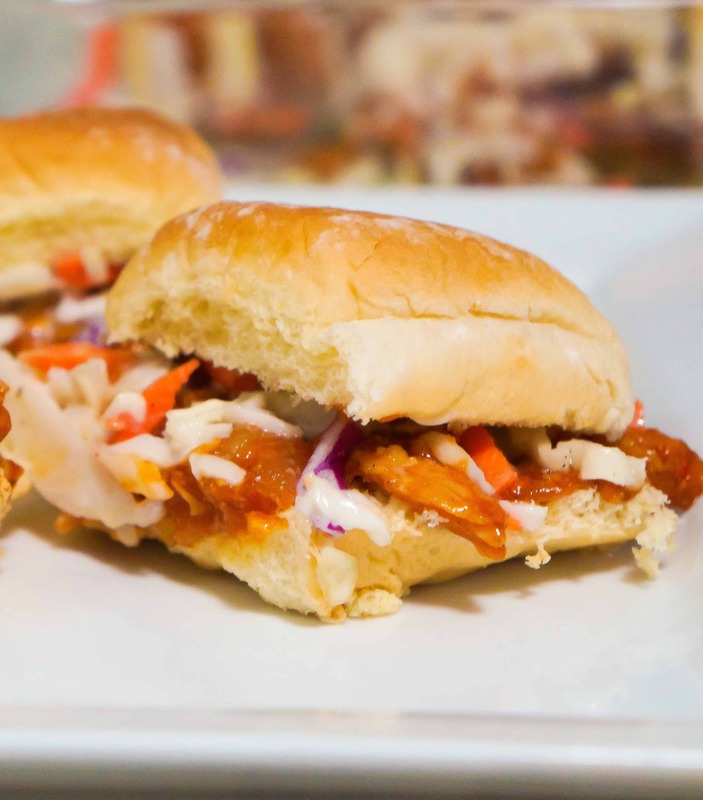 These Sweet Chili BBQ Chicken Sliders are the perfect weeknight dinner or party snack. They are simple to make and can be thrown together fairly quickly if you already have some cooked shredded chicken. I love sliders because you can serve them anytime. They can be a meal, a snack and are the perfect party food. 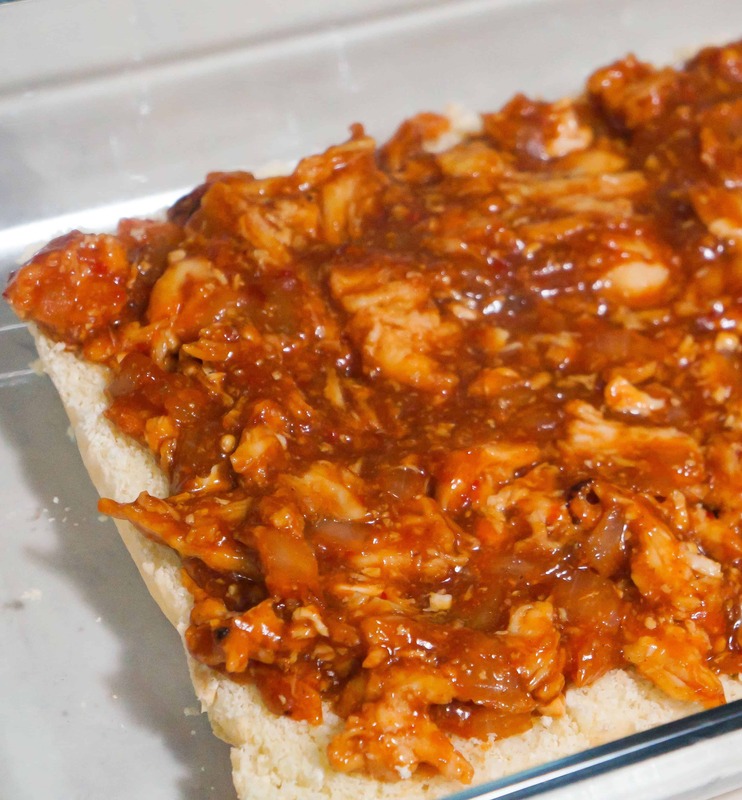 For this recipe I topped Walmart potato dinner rolls with some shredded chicken breast simmered in BBQ and Sweet Chili sauce. I threw some coleslaw on there too for some extra flavour and a bit of crunch. I started by combining the BBQ sauce and Sweet Chili sauce in a saucepan with some water. Then I tossed in the cooked chicken and diced onions and allowed it to simmer for about ten minutes. While the chicken was heating I prepared my coleslaw. I just used one of those salad in a bag kits from the grocery store but you could use whatever coleslaw you like. I removed the tops of the rolls and placed all the bottoms in a 9 x 13 inch baking dish. 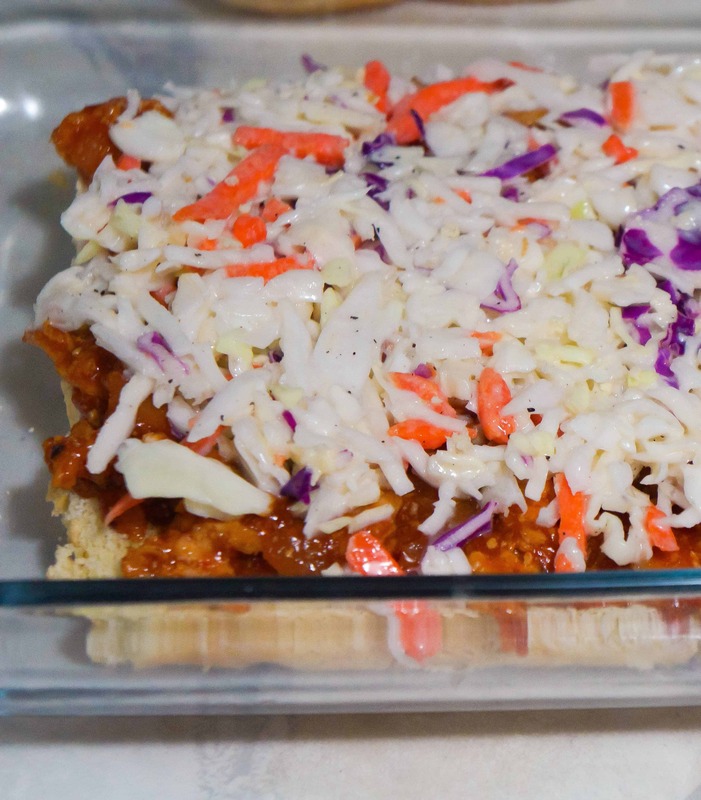 I spread the chicken mixture evenly over the rolls and then topped it with the coleslaw. After this I placed the tops of the buns on and put the sliders in the oven for just a few minutes to toast the buns. You don’t want to leave them in the oven too long or your coleslaw will go limp. These Sweet Chili BBQ Chicken Sliders are delicious and in a super convenient mini sandwich form. 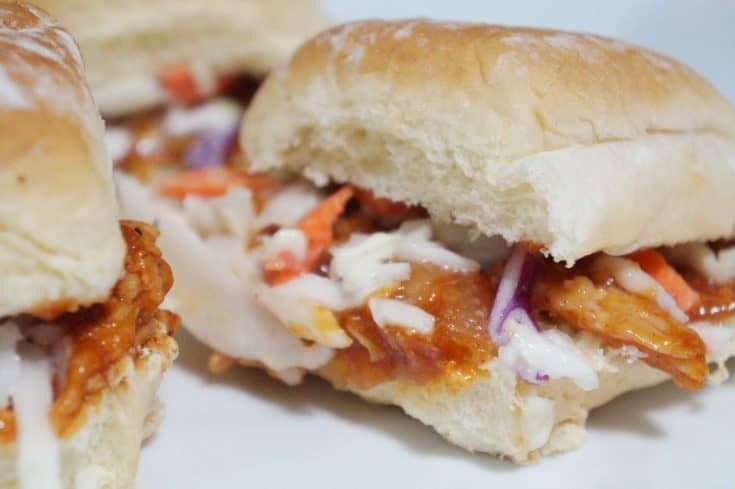 Next time you’re looking for an easy dinner or party recipe try these Sweet Chili Barbecue Chicken Sliders. Serve these at your next party and they’re sure to be a hit. If you’re looking for other easy dinner recipes, check out Shepherd’s Pie Sliders, Loaded Potato Meatloaf Casserole and Cajun Chicken and Biscuits Casserole. 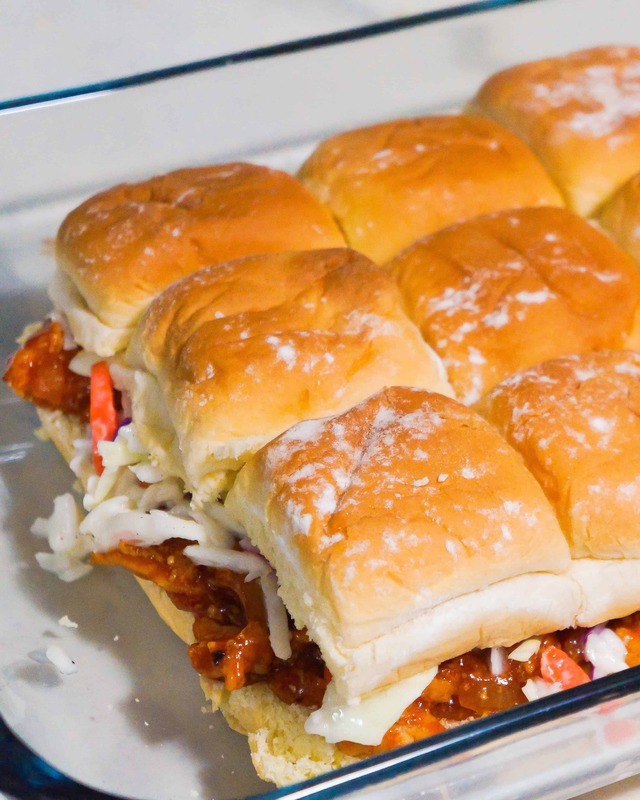 Sweet Chili BBQ Chicken Sliders are a great party food or easy dinner recipe. 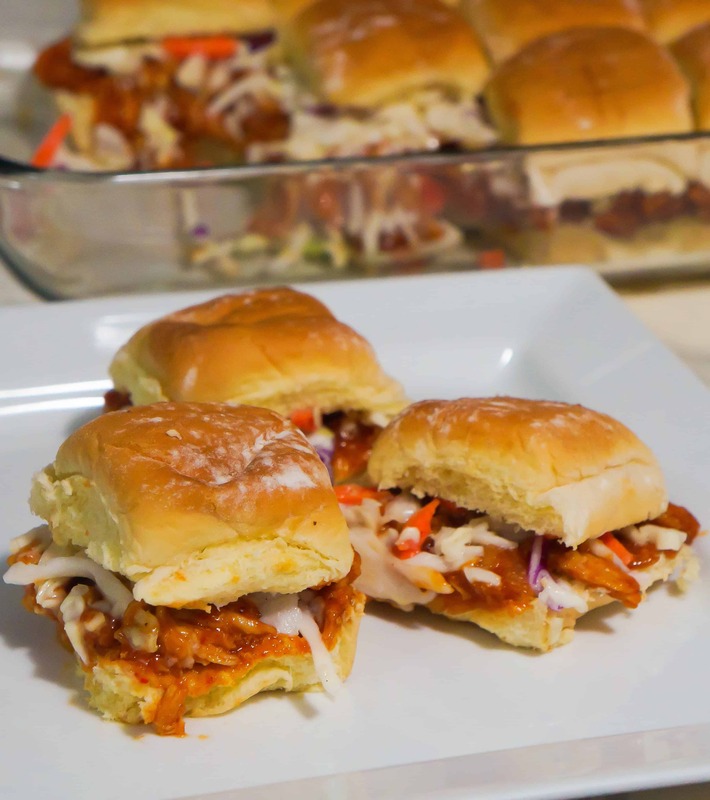 These mini sandwiches are made using leftover shredded chicken tossed in a sweet and spicy barbecue sauce and topped with coleslaw. 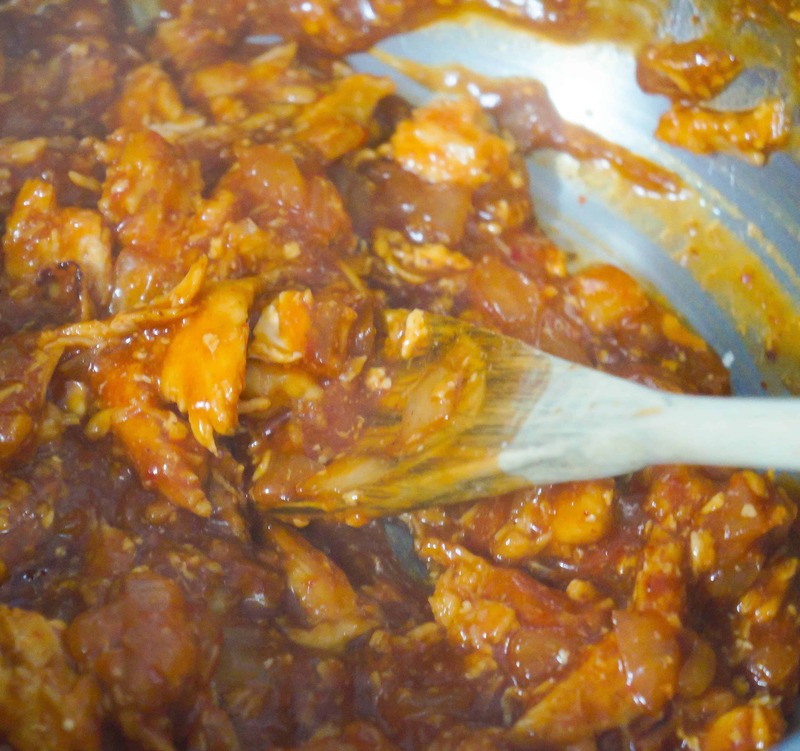 Heat a large saucepan on medium and add the chicken breast, onions, sauces and water. Stir and allow to simmer for 10 minutes. Slice your dinner rolls in half separating the tops and bottoms. Place the bottoms of the rolls in a 9 x 13 baking dish. Spread the chicken evenly over the rolls and top with coleslaw. Finish by putting the tops of the rolls on and baking for 3-5 minutes to toast the buns.